April 15th 1912, 2:20am. 107 years ago today, the doomed luxury liner Titanic hit an iceberg and sank to the bottom of the North Atlantic. In October, I had the opportunity to visit to the Maritime Museum of the Atlantic in Halifax, Nova Scotia. 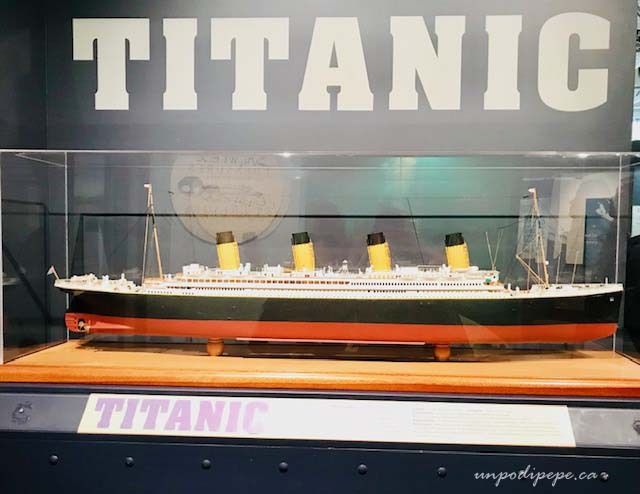 The museum has a permanent exhibit called Titanic: The Unsinkable Ship. The exhibit takes you back in time and tries to recreate what life was like for everyone on board. 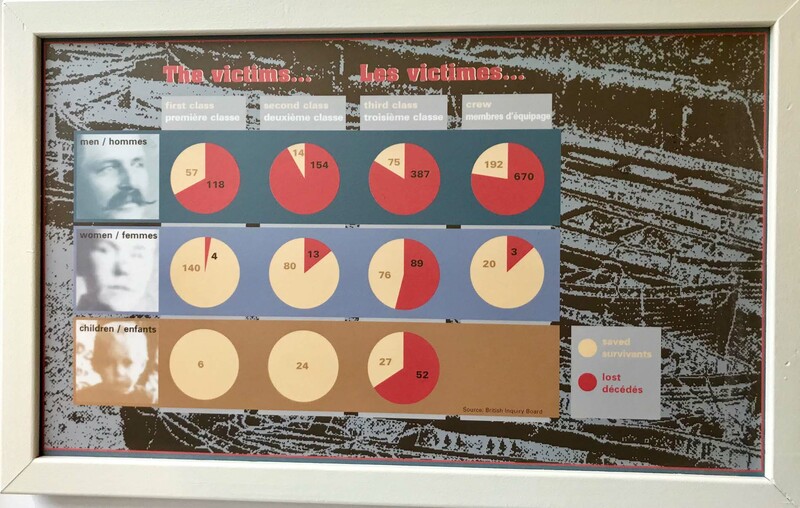 It is interactive, educational and really well done, focusing on the creation and tragedy of the ship, and also Halifax’s connection to Titanic. The collection includes photos, reproductions, and many items that floated to the surface when Titanic sank. These were donated or loaned by descendants of the recovery ship crews. Following maritime custom, fragments of shipwrecks were kept as reminders. This ‘wreckwood’ was not sold commercially, but kept by the families. Some very large pieces of elaborately carved wood and a deck chair were also recovered. 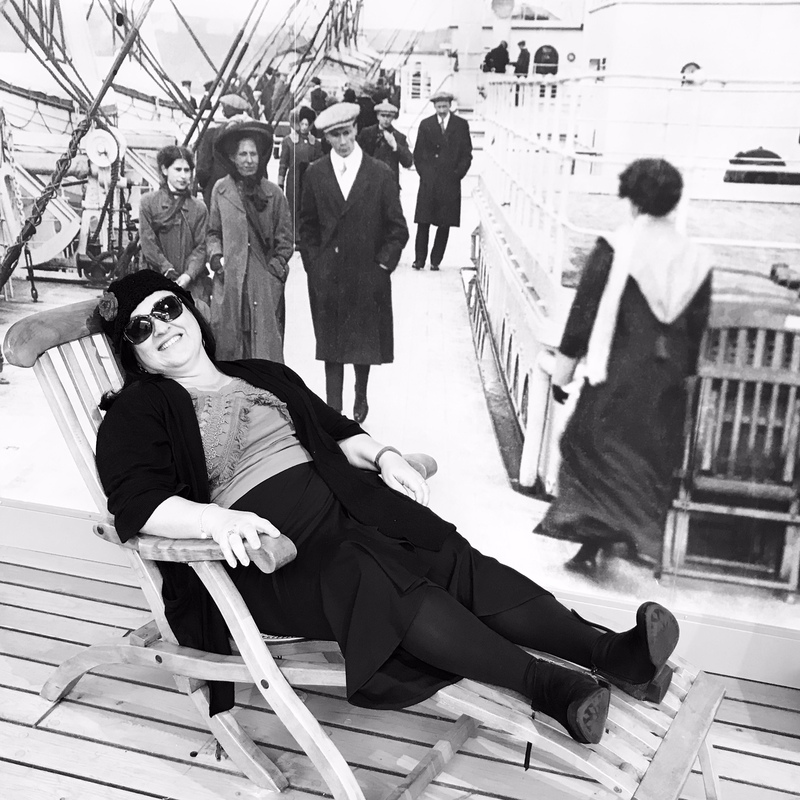 The deck chair was given to Reverend H Cunningham for his work on the recovery ships. It was donated to the museum by his family. 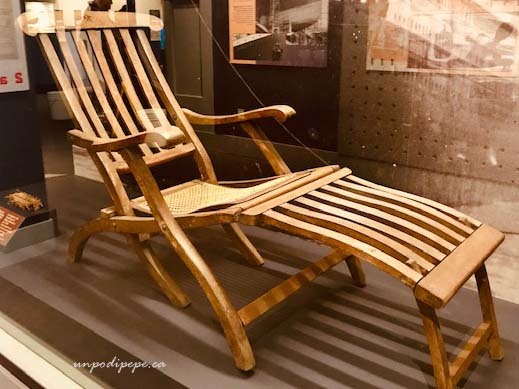 There is also a reproduction deck chair where visitors to the museum can sit and imagine what it would have been like to hang out aboard deck-before jumping into a lifeboat, of course! Halifax was the closest port to the disaster and when the news broke, there was much confusion. The survivors and damaged ship were expected in Halifax. Trainloads of relatives were on their way. Immigration officers, sleeping arrangements and medical care were prepared in anticipation of an onslaught of 2200 cold, wet, hungry, displaced people. As it turned out, the 706 survivors were all taken to New York by the rescue ship Carpathia because the captain thought it was safer to head south than risk meeting another iceberg on the way to Halifax. 325 bodies were recovered from the frigid water, mostly by the cable ship Mackay-Bennett. 116 had to be respectfully buried at sea because they ran out of supplies, ice and embalming fluid. Regulations permitted only embalmed bodies be brought ashore. The 209 bodies were taken to the Mayflower Curling Rink in Halifax. Undertakers came from all over Nova Scotia to help. 59 of the bodies were picked up by relatives or shipped home, and 150 are buried in 3 Halifax cemeteries, one third in unmarked graves. One belongs to a 23 year old J Dawson, the name of Leonardo Di Caprio’s fictional character in the 1997 movie. Titanic’s band bass player and violinist are also buried here. The crew of the Mackay Bennett were profoundly affected by the recovery of an unidentified 2 year old boy. They paid for his gravestone and accompanied him to the cemetery. He was wearing a pair of brown leather shoes. Unclaimed personal effects were burned to prevent souvenir hunting, but the Halifax Police Sargeant in charge could not bear to destroy the shoes. He kept them in his desk drawer until he retired and his grandson donated them to the museum in 2002. 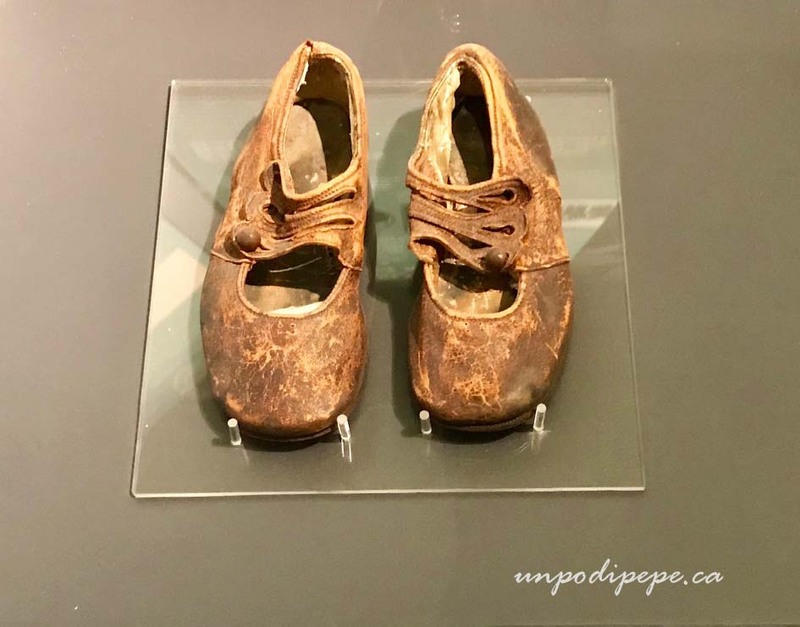 In 2010, scientists were able to use the shoes to identify the child as 19 month old Sidney Goodwin the youngest in a family of 8 on their way to Niagara Falls. 1) Man vs Nature. Titanic was the biggest, fastest moving thing on the planet. According to the builders ‘even God could not sink this ship’. She was considered invincible and unsinkable, yet ironically was gone 4 days into her first voyage. Titanic was propelled with arrogance at full speed at night in an area known as ‘iceberg alley’, steering straight into an iceberg- and no one saw it coming! It turns out the impact of the iceberg should have damaged the ship, but not caused it to sink. 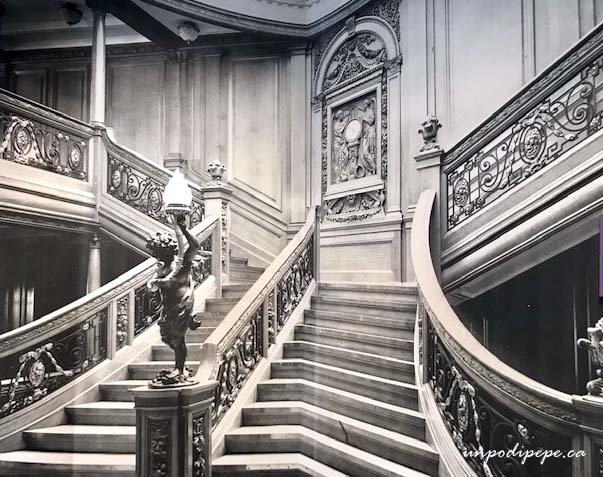 As I learned in the exhibit, Canadian scientists discovered that the steel used to build Titanic contained high levels of sulfur, making it brittle at cold temperatures. This helps to explain the devastating results. 2) Maritime safety- In the early 20th Century, everything was becoming ‘super-sized’, but regulations did not keep up with progress. The White Star Line knew more lifeboats were needed, but did not want to make the deck look cluttered or make 1st class passengers nervous. There was room for 64 lifeboats but regulations only required 16! With approximately 2224 passengers and crew on board, there were only 20 lifeboats with room for 1178 people. The crew had no lifeboat training, so when panic and fear set in, they were massively disorganized and rowed out with 470 empty seats! It was fortunate Titanic sailed at only ⅔ capacity, as there was room for almost 1,000 more passengers. Commercial Wireless traffic had taken priority over ice warnings. 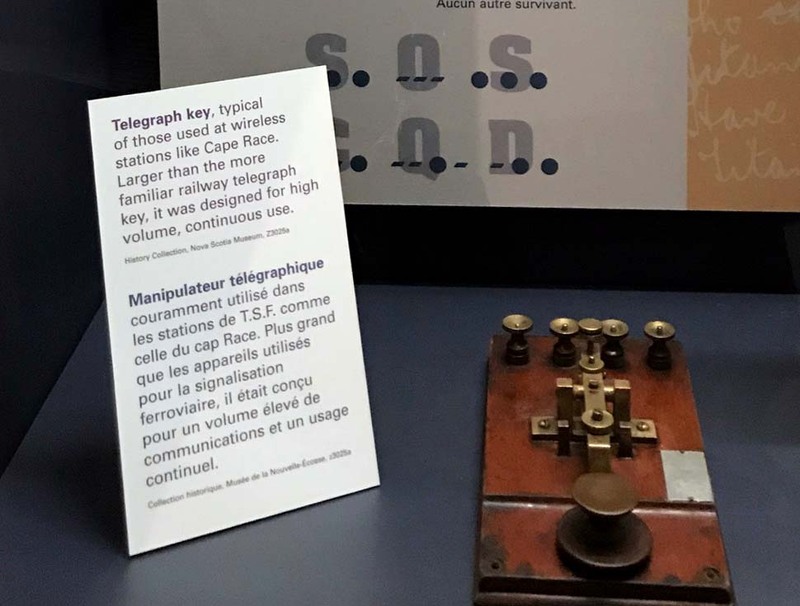 The ship Californian had sent Titanic an earlier iceberg warning, and was close enough to rescue everyone, but her wireless operators were tired and asleep so did not respond to Titanic’s distress call. The captain even saw thought he saw flares, but did not respond. Safety regulations and procedures at sea improved immediately, ensuring lifeboat space for everyone on board, regular lifeboat drills, and continuous wireless watch for distress calls became mandatory. 3) Social inequality at the turn of the century -There was an extreme contrast of passengers on board-the richest man in the world, John Jacob Astor IV, returning from his honeymoon, passengers returning from the Grand Tour, and the lower deck filled with impoverished immigrants heading to a new life in America. The classes were tightly segregated by locked barriers. The survival rate for 1st class women was 97% and for 3rd class men 13%. 4) Media-Titanic went down at the beginning of the communication age and was the first real disaster heard around the world. The first reports were from wireless operators on Carpathia. When she arrived in New York on April 18th, Carpathia was surrounded by hundreds of small boats chartered by news agencies. The captain threatened to shoot any newsman who tried to board his ship. 5) Personal stories-It took 2 hours and 40 minutes for Titanic to sink. This provided time for survivors to witness the drama taking place-suffering, sacrifice, bravery, selfishness, cowardice, heartbreak. We all know that the band kept playing to keep the passengers calm, and about the older couple who died in their bed together as she would not get into a lifeboat without him, and the richest man in the world putting his pregnant wife on a lifeboat then bravely going down with the ship. The stories were about real people and the public could not get enough. 6) Constant presence in popular culture-The silent film ‘Saved from the Titanic’ was released one month later, starring Dorothy Gibson, a real survivor, wearing the same outfit she was wearing that fateful night. 2 more movies and many books were soon released. The hype continued until 1918, then WW1, the Great Depression and WWII overshadowed Titanic. In 1953 a new ‘Titanic’ movie was released, then the 1957 book ‘A Night to Remember’ sparked renewed interest. Walter Lord interviewed >60 survivors, some of them speaking for the first time. The wreck of the Titanic was discovered SE of Newfoundland in 1985. The ghostly images from the ship’s graveyard at the bottom of the Atlantic brought it back to life. Then of course the 1997 James Cameron blockbuster renewed interest again. There have been at least 15 movies/documentaries, 13 TV movies/miniseries and almost 200 books about Titanic. 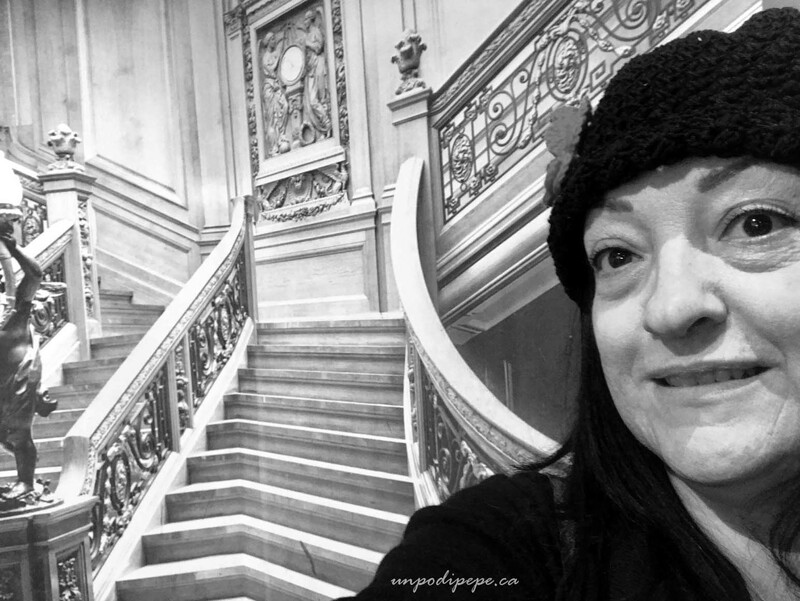 I hope you have enjoyed my thought provoking visit to the Titanic exhibit. Despite the tragedy, we have the Titanic disaster to thank for improving maritime safety, and bringing to light the injustices and social inequality that were present at the time. If you happen to visit Halifax, do not miss the Maritime Museum of the Atlantic.